How about a BCAA review for a change?! I’m excited too. Our first EVER BCAA review will be on the Ideallean BCAA’s, from Idealfit. In this review I’ll go over a few really important aspects of the product, including the flavors, the the flavors, and the flavors. Lol. Just kidding. But not really. I really am going to spend most of this review talking about the flavor. But I’ll go over several other aspects of the Ideallean BCAA’s as well- including, but not limited to, the packaging, the formulation, and of course the price-point/value. So if you are ready to learn literally everything you could ever want to know about the Idealfit BCAA drink, you are in the right place, and I’m ready to impress you with my fun, energetic, review style. Who’s ready for a fantastically amazing Idealfit BCAA review? You are! Woo! Let’s do this! I don’t know where this surge of energy is coming from. I just rolled out of bed and I haven’t had NEARLY enough coffee yet today. But I’m doing alright energy-wise, clearly. Maybe these Ideallean BCAAs are actually giving me a bit of an energy boost themselves? In case you are not sure what BCAA’s do, they actually help your body manufacture energy during athletics. They are a primary energy source for your muscles, and when you supplement with them, you eliminate the need for the body to metabolize stored amino acids from your existing muscle mass. So they are very important in both providing energy, AND helping with recovery. I’m a big fan of BCAA supplementation, and I know many of you guys are as well, which has become clear as soo many of you have asked me about which BCAAs that I take. And the truth is, that most of these products are very, very similar, so you pretty much can just try several of them and they will all perform more or less the same. But as always, there are higher-end BCAA formulas, and lower end. So let’s talk about the Idealfit Ideallan BCAA formula first. Most BCAA product formulas are very, very basic and you can usually close your eyes and recite the supplement facts before even looking at it. You usually have 4-5 grams of branch-chain amino acids, alongside some artificial flavors and sweeteners. Maybe some B-vitamins if they’re really getting fancy. Idealfit has spiced their BCAA formula up a little bit. You have a hit of your three BCAA’s, alongside some other goodies that elevate workout performance and recovery, such as Glutamine, coconut water powder, and L-Citrulline. But I don’t mind gimmicks. They look good on the marketing. And Idealfit is dong a nice job overall with their products so I don’t mind a little romancing. 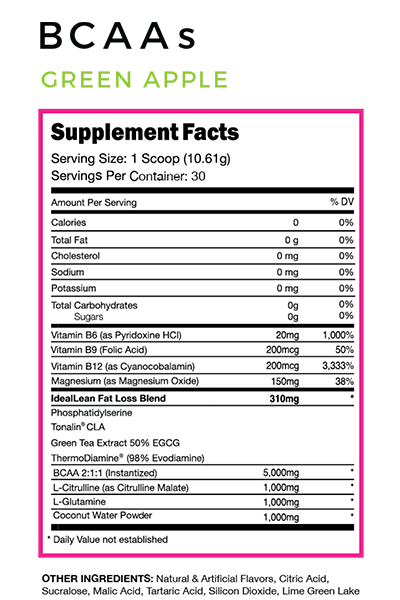 Ideallean BCAA’s contain 5g of BCAA per serving, which is a decent little amount, and really the only metric worth anything in a BCAA product. I’ll give them an 8/10 on their Ideallean formula. Now on to the hard part: the taste. IdealFit Ideallean BCAA’s Taste Mediocre. I think BCAA’s must have a really foul flavor on their own because Idealfit Ideallean BCAA isn’t the only BCAA product that I’ve tried, and then been like ‘OMG EW’. And I’m not just being dramatic. Some of these flavors are actually really bad. I tried the Green Apple Ideallean BCAA first and nearly gagged. Part of that is probably me having a pretty deep hatred of artificial apple flavorings, which is what they use (and ALOT of it), but Alex tried it too and she was not a fan. The Orange flavor that she bought was a little bit better, but still had sort of a nasty aftertaste. I think both the orange and the apple were a little bit too syrupy-sweet, and then had so much sour-ness to them that they really aren’t as refreshing as they are just over-bearing. Like. When I’m on mile 7, the last thing I need is a big huge sour sweet flavor washing over me. It’s just too much. EDIT: I have now tried the Raspberry Lemonade flavor and it is much better than the other two Ideallean BCAA flavors that I’ve had. The raspberry lemonade is a tiny bit less overbearing, and so it’s a little more refreshing and drinkable. What I'm saying is that the best flavor of Ideallean BCAA is the Raspberry Lemonade. I do think overall these flavors need work though. Of the three that I’ve tried, none of them are over a 9/10, and none of them are flavors you look forward to. There’s also something that Alex called ‘BCAA breath’ which I also started to notice- like for 90 minutes after you drink Ideallean BCAA, your breath has kind of a stagnant odor to it. Not like garlicky or red-onion breath, but like…supplement breath. I don’t know. It’s not a deal breaker but it’s a drawback. I give Ideallean a 7.5/10 on flavor. As you know from my Ideallean pre workout review, and my Idealfit Protein review, I’ve never been a fan of these products appearance. They lack imagination, and the fruit graphics that are plastered all over the Ideallean BCAA’s look super cheesy, jagged, and low-budget. Like. C’mon guys. Hire a decent graphic designer. Look at Protein World Slender Blend. The products look like a MILLION bucks compared to this trashy black and pink jar. Or look at Devotion Nutrition (love that company). Those of you that have read a few of my reviews before know that I’ve never been a fan of the standard black and hot pink. It looks horrible. 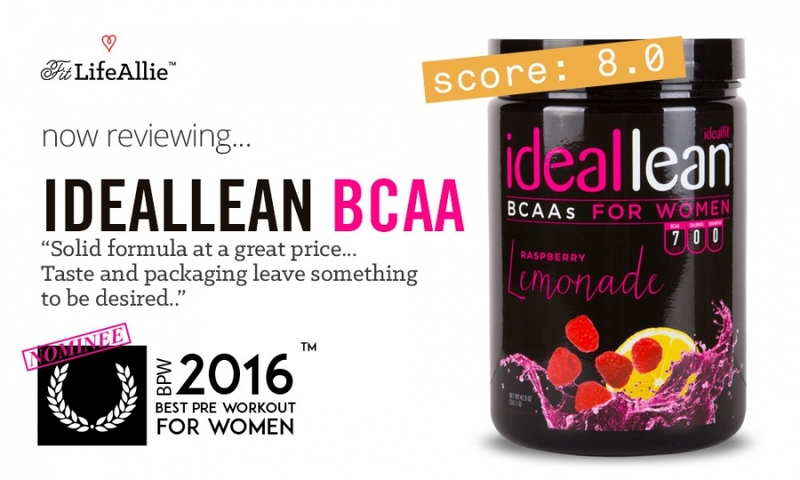 And Idealfit definitely didn’t pull it off well with any of their products, including Ideallean BCAA. 7/10 on packaging.